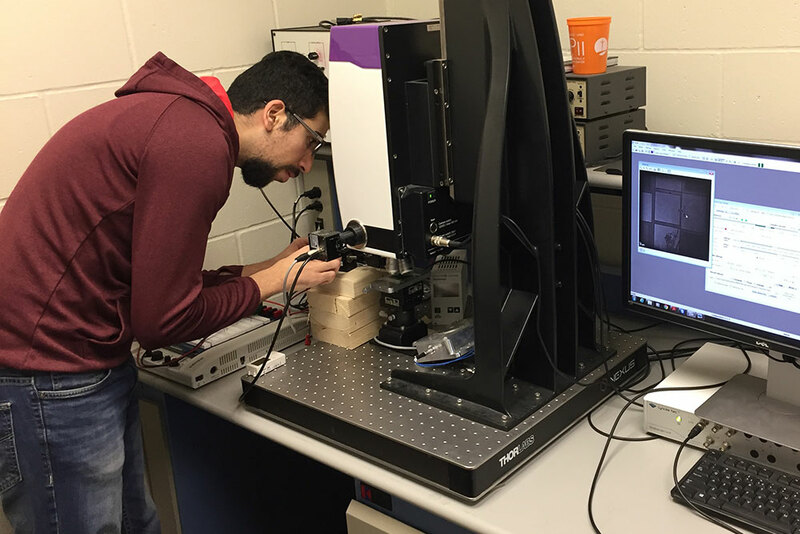 Mohamad H Hasan, a Ph.D. student in mechanical and materials engineering, works on a sample of soft material that has MEMS technology. Fadi Alsaleem, assistant professor of architectural engineering. Inspired by biological systems such as human skin, eagle wings, octopus tentacles and elephant trunks, Nebraska engineer Fadi Alsaleem has a patent pending for a micro-electromechanical systems (MEMS) technology capable of integrating sensing, actuation and computation internally within a soft material. The development and advancement of these smart materials will allow the materials to perform complex computing and respond without the need of a conventional computer system. That will have an impact on a large variety of applications, said Alsaleem, assistant professor of architectural engineering. Those could include airfoils that change their aerodynamic profile to skins with a realistic sense of touch that will allow for robots to do work that has typically been hazardous. Traditionally MEMS has enabled low cost, low power, and very small sensors. Thanks to MEMS, almost a dozen sensors can now fit in a smartphone with power consumption in the microwatt. However most these MEMS sensors are limited to acquiring signals and sending them to computing units that can perform complex tasks. Alsaleem, assistant professor of architectural engineering with a courtesy appointment with the Mechanical & Materials Engineering department, has been working for years on a novel MEMS integrated solution, and said this technology is a huge step forward in the typical sensing-and-computing process. “Artificial intelligence is all the buzz right now, and there’s a push to see how small you can shrink processors or the amount of power they will consume,” Alsaleem said. The new MEMS technology, Alsaleem said, could spur advances in a burgeoning smart building industry – for which Alsaleem and The Durham School of Architectural Engineering and Construction have been on the leading edge, having held the first Smart Building and Internet of Things (SBIoT) workshop in November 2018. Alsaleem also said creating a smart material that uses a the new MEMS technology would save lives and cut costs in medical fields by making robotic surgeries minimally invasive. “The doctors we’ve talked to say the main issue is the current robots have rigid bodies that can cause additional problems that have to be fixed during the surgery,” Alsaleem said. 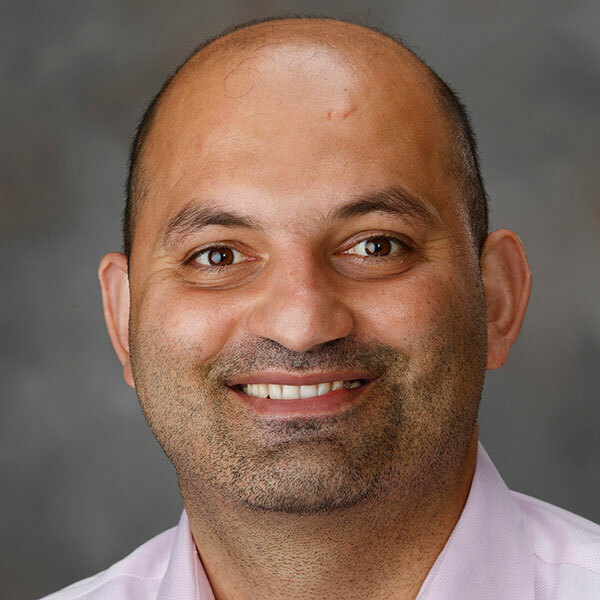 In addition to working with NUtech Ventures on a patent, Alsaleem is also seeking federal funding for the project and is spreading the gospel of MEMS and the soft materials he’s developing. In the past few months, Alsaleem has had articles about MEMS published in four prestigious journals – IEE Explore, Advanced Electronic Materials, Nature Scientific Reports, and Applied Physics Letters – and is organizing a seminar to be held at the American Society of Mechanical Engineers (ASME) International Design Engineering Technical Conferences & Computers and Information in Engineering (IDETC-CIE) Conference this August in Anaheim, California.